The Doom Metal version of the summer blockbuster is here! 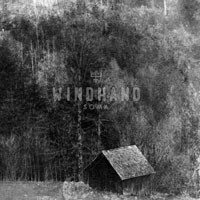 Before ever having actually heard Windhand, I stumbled across an ad for their first release, a self-titled released on a label called Force Field. What happened next seldom happens to me, if ever at all. I was instantly driven to order it, sound unheard, based on album art alone. I’m not usually that impulse driven, but there was just something about their spectral white logo (unfortunately omitted from gracing this album cover), floating over a shot of some dilapidated house (a la Black Sabbath’s debut). There stood the eerie manor, polarized in purple and screaming silent desolation… probably containing unspeakable horrors within its gates… If that isn’t an allegory for the relationship between the cover art and the musical contents then I don’t know what is! At no point throughout this all did the fear of a sucky record being delivered to my mailbox cross my mind. On Soma, Windhand does not attempt to fix what isn’t broken. They aren’t trying to reinvent themselves, or Post/Prog themselves up, they have simply cooked up another batch of their distinctly hazy Stoner Metal to turn minds into mush with. Even the album art is relatively similar, if not fundamentally the same (the one notable bummer about this album, I thought). They further their anthology with their distinct sound, a paradoxical marriage of overdriven guitar heaviness over a hard hitting yet sloth-like swing, paired with the ethereal lamentations of Dorthia Cottrell’s ghostly, banshee wail. As the Doom scene quickly becomes more of an equal opportunity genre with more than a fair share of female vocalists to nocturnally emit to, Cottrell is by far the most celebrated. Early album cuts such as “Orchard” and “Feral Bones” are saturated in the quintessence of what this band does best, big scary riffs that result in the listener screwing their face up into classic “mean-guitar” pouty grimaces. “Evergreen”, however, shows a deviation from their form as they go unplugged for a spell, letting Cottrell prove that those pipes work well even without the accompaniment of distortion pedals- knobs twisted to thirteen. It has a warm, earthy feel that doesn’t get outweighed by its folkloric, looming melancholy. Almost more remarkable is that the song never once gets buried beneath the wall of sound that is the rest of this album, holding fast an identity all its own that fits perfectly into the overall tone of the record. The epic, half-hour closer “Boleskine” is also worthy of mention. This frosty number begins with a molasses-rich sounding acoustic bit, warmly strummed beneath the howls of freezing northern winds. The quiet lull comes to a crashing end under the weight of what may very well be the heaviest (albeit most minimal) riff on the entire album, saddled of course by a grieving howl courtesy of Windhand’s fabled chanteuse. The crestfallen melody of this big finish hits you like a sledgehammer to the chest, leaving you breathless with its sullen beauty. After a 13 minute trampling under foot of this saturnine behemoth of a song, clean acoustic guitar resurfaces to lure you into a momentary sense of security, only to bury you again under the riff equivalent of a mountain of rubble. Soma is a stellar effort on this Virginia band’s behalf. It may be a tough listen for Doom Metal passers-by, as the droning guitar approach and snail’s-crawl tempos can be off-putting to unscarred ears. On the other hand, I actually think that this album is as great an introduction to this band as any. For followers of the Doom Metal genre whom by now are perfectly capable of resisting its trademark funeral dirge delivery, this thing is top-shelf material that will make many bongs rattle from its low-end roar. Enjoy!